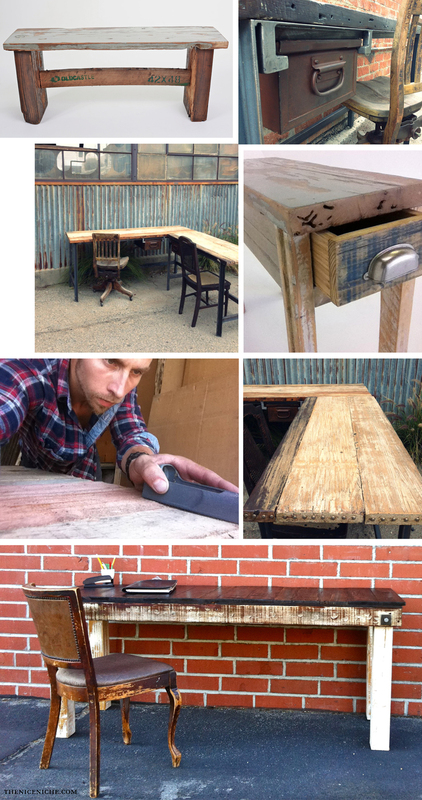 This desk is made from reclaimed wood sourced from in/around Los Angeles. It is a sturdy desk with a steel base. Repurposed single metal drawer. All wood all steel. We can modify the the desk size based on customer preference. There are so many little details on this desk, from the unique drawer to the beautiful wood - each order is unique and each drawer is different. Don't hesitate to ask for more photographs or to work with us on making your dream desk. Multiple desks can be put together to make a work station. Custom latches available to attach units. The Edison finish has an industrial feel with a distressed white frame and strong lines. Named after the Edison building in downtown LA. It's classy but a still rough around the edges. Michael Dionne was born and raised on a dairy farm in Newburyport, Massachusetts where he learned, "We make do with what we've got. Need a table? Build one. Need a Window? Make one." Inspiration comes from a combination of his childhood memories of the farm, the modern industrial landscape of Los Angeles, and the life that inhabits it. When a client places an order, the design process begins. Wood is selected and with every board chosen we give it a new purpose and a new life. Table legs, knobs, hinges and hardware are all examples of handcrafted details that come next - each unique, and each is made with a particular customer in mind. 800 miles of alley in LA. We are cleaning up each alley 1 mile at a time. Our mission is to provide quality custom furniture made from reclaimed materials for all of Los Angeles. Each piece is custom made using reclaimed wood or industrial relics. Unlike mass produced factory furniture, our custom furniture repurposes remnants from a city in constant change. The handicraft exemplifies unparalled craftsmanship and solidity of construction capturing Los Angeles history in each piece. Architectural Waste carefully sifts through LA to select every piece of wood and repurposed industrial metal. Crafting each piece of furniture by hand, we guarantee that no two are alike.